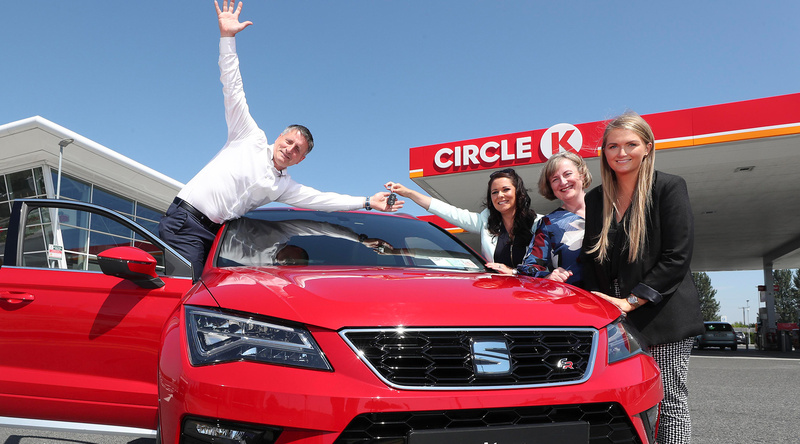 Monday 2nd July 2018 – Circle K (formerly Topaz Energy), Ireland’s largest fuel and convenience retailer, is delighted to announce Owen Laverty as the winner of its winter car raffle, an initiative that was put in place to help raise much needed funds for Circle K’s charity partner, The Jack & Jill Children’s Foundation. Today’s announcement coincides with Circle K revealing that it has raised €350,000 to date for The Jack & Jill Children’s Foundation, through various fundraising initiatives undertaken by customers and staff nationwide. This includes Small Change for Big Change, The LEGO® Exchange, Raise a Teacup and the Winter Car Raffle which ran in conjunction with SEAT Ireland, along with multiple events held internally for staff. These campaigns have resulted in the provision of almost 22,000 hours of home care nursing to date for the Jack & Jill Children’s Foundation. Founded in 1997, The Jack & Jill Children’s Foundation provides direct funding to families of children up to the age of five who suffer from severe intellectual and physical developmental delays. This model of care puts the family at the centre, providing home nursing and respite care that meets their unique needs. Circle K is an international chain of convenience stores, founded in 1951 in El Paso, Texas, United States. It is owned and operated by the Canadian company Couche-Tard. Circle K employs over 125,000 employees globally and has 15,700 stores in over 20 countries worldwide. The Jack & Jill Children’s Foundation must raise €3.5 million every year to fund its unique home nursing care and respite service which is provided to sick children, from birth to 5 years of age, around the country. Typically, these are sick children who suffer from severe development delay as a result of brain damage, who may not be able to walk or talk, are tube fed, oxygen dependent and in need of around the clock care. The Jack & Jill service operates 365 days a year, has no waiting list and mobilizes an army of 750 nurses and carers around the country and has done so for 20 years. SEAT Ireland is a subsidiary of SEAT SA with responsibility for a 23-strong dealer network in Ireland. The brand recorded a record-breaking sales performance in 2017 with an 18% increase in registrations year on year against a market decline of 10%. Fuelling SEAT’s success in 2017 was the iconic SEAT Ibiza, which was the brand’s best-selling vehicle overall. The SEAT Ateca, SEAT’s award-winning, first ever SUV model, came a close second enjoying outstanding sales in its first full year of trading, with over 850 units delivered in 2017. Furthermore, SEAT’s commitment to offering motorists attractive finance offers has led to a surge in the number of customers financing their purchase, with 51.8% of sales assisted through Volkswagen Bank. This is compared to 42.1% in 2016.